· The most distinctive feature of this snake is the presence of glistening, broad bands of yellow, alternating with black (Fig 12.11). These alternating bands encircle the body and are almost equal in width. 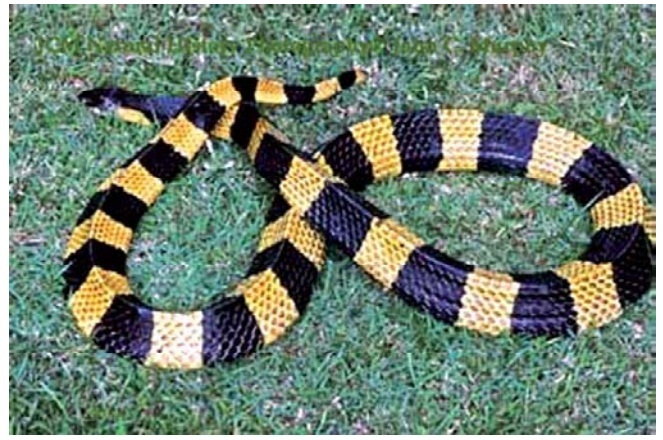 · The banded krait has a marked vertebral ridge that gives it a permanently emaciated look with a distinct blunt tail. Considered a harmless snake, the banded krait rarely bites.